If you managed your money like you would a business what would your finances look like? I’m willing to bet they’d be in much better shape than they are now. When you operate a business you watch your bottom line. After all, who wants to run a business that isn’t profitable? The whole point of starting a business is to make money! If you want to put yourself into a better financial situation the answer is simple: run your personal finances like you would a business. Business owners know that to be successful they need multiple streams of income. This could be from selling various products or offering multiple services. If one income stream fails they have another to lean back on. For you this means not only working to bring home money from your day job, but also looking for other opportunities to create income. Start a side business. It’s really not hard at all. You can turn almost any of your skills into another income source if you’re willing to put in the work. If you were in business how closely would you watch your expenses? I’d bet you’d cut out everything that you didn’t need or wasn’t helping you to add to your bottom line. In your personal life this can be tough. What expenses should you cut? My advice would be to take a good look at your budget. What are you paying for on a regular basis that doesn’t add value to your life? A way too expensive cell phone? Are you still paying for personal bank checks? A deluxe cable package? A fancy car? Too much house? If you’re paying for something that isn’t bringing true value to your life eliminate it from your budget. And speaking of budgets, you do have one, right? One expense a business can’t survive without is payroll. Where would a business be without reliable employees? 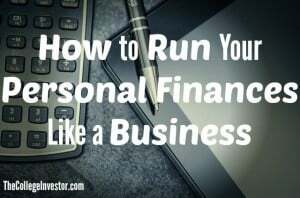 Treat yourself as the employee when you run your personal finances. You should get paid before anyone else does. As soon as you get your paycheck send a certain amount to savings each week before paying any other bills. By doing this you’ll get into the habit of always paying yourself first. If a retail business loses their store to a fire what would happen? What if a co-owner of a business passes away? What would happen if someone came into a retail establishment slipped, fell and sustained an injury? All of these occurrences could lead to the demise of the business – that is why business owners insure against these types of risks. Just like a business owner insures against potential risks, so should you. Get your insurance situation straightened out. If you’re the sole income earner you need life insurance and disability insurance. You should also make sure you have quality home, health, and auto insurance in place. When you create your multiple income streams and slash your expenses you should (hopefully) have a positive cash flow. Now make that money work for you. Start researching investments and invest your money wisely. You can invest in the stock market, real estate, or other alternative investments. And don’t worry if you’re new to investing; it’s pretty darn easy. If you need help getting started invest some money in the Investing 101 Course! Businesses optimize their systems regularly. In order to stay profitable and competitive a business needs to be as streamlined as possible. For you this means automating your savings and investments, staying on top of your budget, and working on being more productive with your income streams. Consider using a site like Personal Capital to keep track of all of your accounts or set up a spreadsheet where you can track your finances. 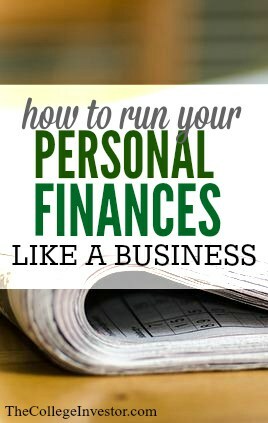 Can you imagine what your personal finances would look like if they were run like a business? Your financial situation would improve greatly if you kept the long term picture in mind. By taking the time to set up systems that will help you run your personal finances more effectively and efficiently you’ll be able to accomplish any long term financial goal you have! Do you run your personal finances like a business? Wow, that’s another level to look at things. I wonder how long you have been following this method. I really like the business analogy. It’s often hard to increase the income as a family so the scrutiny of trimming operating expenses becomes the key! This is a great way of thinking.